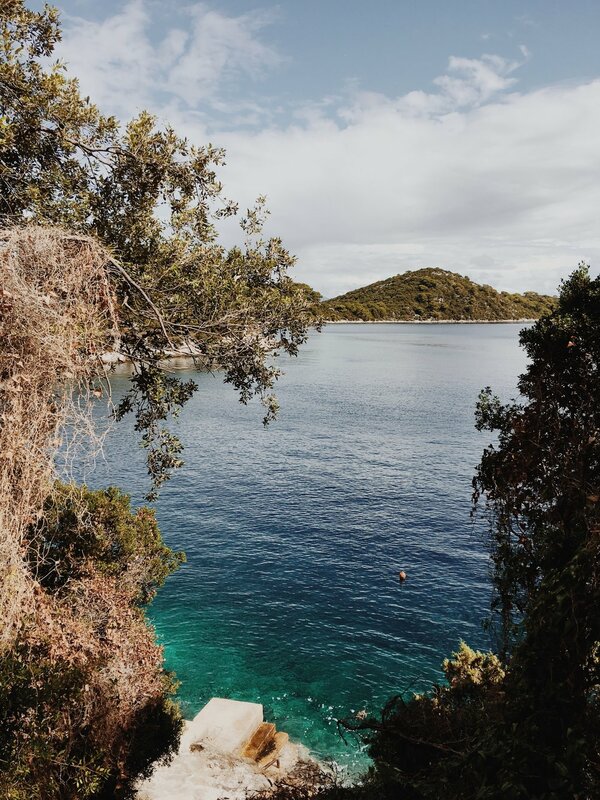 Covered in luscious green forest and surrounded by turquoise waters, Mljet is the most enticing of the Croatian islands, with 70 percent covered in pine forests, we found paradise. So tranquil and untouched, it feels as though the island is yours. Head west and discover the beauty of the salt water lake National Park and make your way south for untouched coves, white sand beaches and stretches of exceptional, unmissable, scenery. Just one road keeps this island moving, creating an island adventure of complete silence, relaxation and rest. This is Mljet, a guide to how best explore the island; from where to stop and stay, to the most beautiful places to swim. 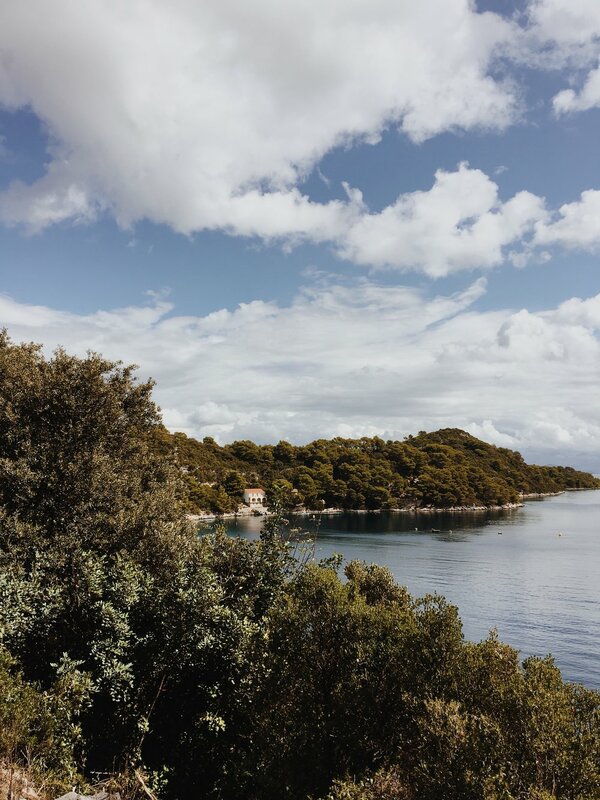 Discover Mljet in all it's beauty, in this Island Edit. Accommodation other than apartments or villas is limited, with luxury boutique Hotel Odisej, being the only hotel on the island. Nestled amongst the beauty of the National Park, there's 88 deluxe rooms with balcony's and sea views to choose from and looks like paradise. 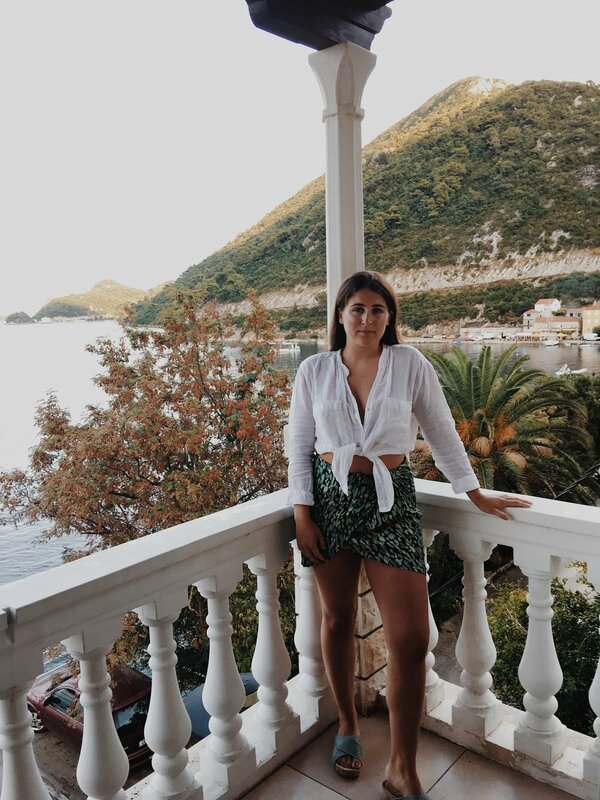 We had a cosy studio apartment in the heart of Sobra, surrounded my Pomegranate trees with a balcony offering mesmerising views of the beautiful Adriatic and steps in-front, taking us into crystal clear waters. Endless bowls of pasta, copious amounts of bread and Croatian wine with this view, was perfect. After week one, we decided to extend ours tay in Sobra and moved to a new apartment further along; a new balcony, more pasta, more card games and handily, above a coffee shop. 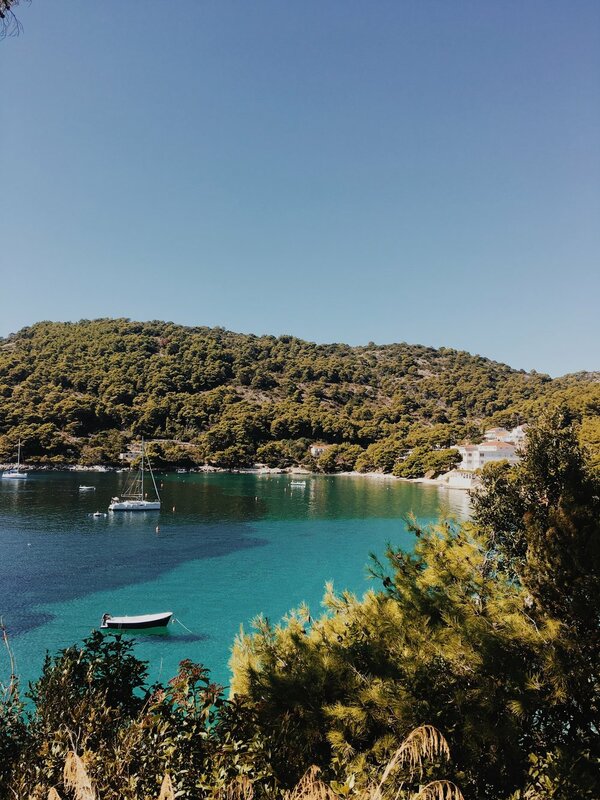 With so many tiny villages and idyllic looking locations in Mljet, deciding where to stay having never been before, wasn't easy so to narrow down our choices, we went straight onto Air Bnb to see what was available. Sobra, Polace and Pomena were the main places that kept popping up page, after page and after doing some research on both, we opted for a 1 week stay in Sobra (soon to be extended to 2 weeks as we fell more and more in love with it). Sobra is a small bay, pretty much slapped in the middle of the island, making travelling to either end of the island do-able, in around 30 minutes. The village has nothing but a very small supermarket, 2 restaurants and endless lengths of ocean to dive into off rocks that run alongside the one windy road in Sobra. The entire western side of the island is declared a National Park, made up of two fresh seawater sale lakes; Veliko and Malo Jezero and a Monastery, surrounded by luscious Mediterranean forest making the experience, breathtaking. You can explore by foot, by bike or kayak and there's an opportunity to swim anywhere. Take a trip to the Monastery by boat where you can stop for coffee or lunch and enjoy the views of the open lakes of Mljet National Park. When visiting Croatia, don't expect golden sandy beaches that carry on for miles and instead, imagine rocky coves hiding some of the most incredible swimming spots and underwater sea-life, hidden pebble bays that open into wide ocean and white cliff rocks with deep sea beneath. You can simply swim, anywhere and experience the magical waters and some of the best snorkelling. This must visit spot in Mljet was supposedly the home to Odysseus for 7 years and now, homes some of the most breathtaking snorkelling, the deepest of seas we discovered in Croatia and one of the most perfect sunbathing, diving and swimming locations on the island. Located near the village of Babino Polje, the cave is available by boat or foot and the 20 minute downhill, windy path of rocks and stones is well worth the views and swimming experience. Sit and bask in the sun with a book, snorkel or jump off high rocks, the beauty here is like no other. Tip: bring a picnic! Located right in the middle of the island, Sutmiholjaska bay is hidden away and not one you will discover when driving along, which is what makes this place so special. 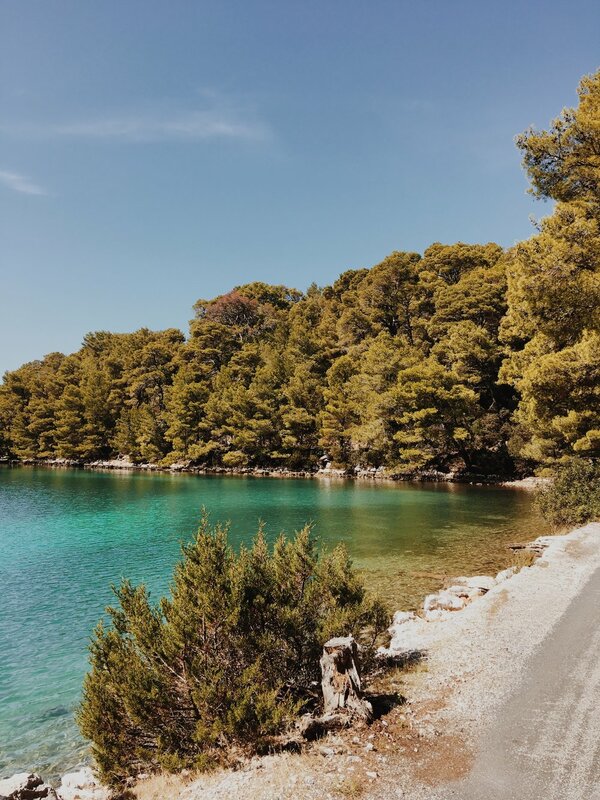 Take a long windy and mountainous road off the main island road, keep on winding down for about 15 minutes and enjoy the breathtaking views along the way, of Mljet's Adriatic. Surrounded by nothing but white cliff rocks and a tiny old un-lived in house, you won't find anything here other than clear aqua waters, the odd boat and in our case, a dog. It's true beauty and the perfect place to spend the afternoon. After 5 weeks of pebble beaches and sunbathing on rocks, comes a craving for sand making a trip to the Southern tip of the island, essenitial. Here, you can discover the golden sandy beach of Vela Saplunara; keep walking around and you'll find Mala Suplunara beach and even further, you reach Blace. With sun-beds, cafes and ice-cream stalls above the beach, its' fully equipped for a day of swimming and eating, no picnic needed. Untouched, beautiful waters and a short trip by moped or car, it's an unmissable spot. After a 6 week adventure of moving from island to island, for us, Mljet was the home of nature, relaxation and paradise. A place we discovered some of the most beautiful views we've seen, swam in waters clearer and more turquoise than we ever have before and came to the realisation that despite my best efforts, I can't ride mopeds.